The wife of UFC star Tony Ferguson issues a statement explaining the restraining order she recently filed against her husband. Yesterday (Thurs. March 14, 2019) it was reported that the wife of UFC star Tony Ferguson, Cristina Ferguson, filed a restraining order against her husband. The restraining order was filed Wednesday (March 13, 2019) in Orange County California Superior Court. Cristina Ferguson’s restraining order against Ferguson alleged domestic abuse. The initial report included several police reports in which police were called to the Ferguson home. In those reports, Ferguson was alleged to have torn apart his home’s fireplace, and also allegedly told an unidentified male that someone was “inside his walls.” One of the reports also suggests Ferguson believes someone put a computer chip in his leg. UFC President Dana White recently said that “personal issues” have been keeping “El Cucuy” outside of the Octagon. 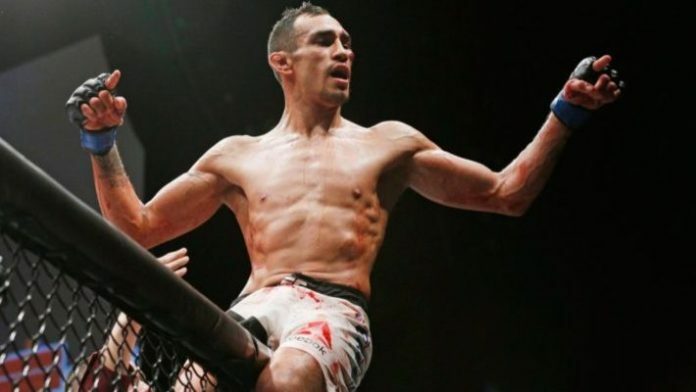 What do you think about the current Tony Ferguson situation?